Aurel and Zora Schwartz are an average couple next door, except Aurel is a sleepwalker. Livie (Zora’s daughter) witnesses Aurel doing something strange. This starts a ripple effect that takes the reader down a wicked way. From start to finish you can feel the dread building! Warning: This is a very disturbing read! The ending is horrifying! I didn’t see the ending coming! 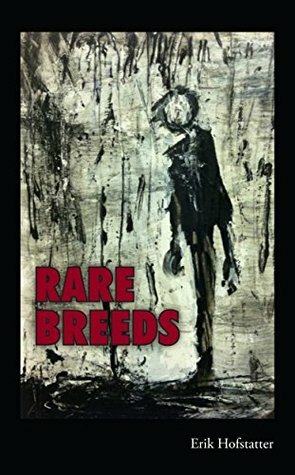 I didn’t know what to expect with Rare Breeds. The writing is great and fluid. The writing is lean and straight to the point. The characters have actual depth and the author makes you feel for them. The author’s descriptions bring the characters and places to life. There are several twists and turns along the way to keep the reader entertained. I also liked how he used the local dialect in his writing. The dialect is a positive addition to this creepy tale! The artwork by Jack Larson makes the story even better! This is my first time reading Erik Hofstatter, but it won’t be my last! I will definitely read his other work!